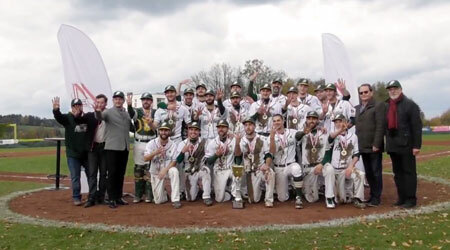 The Athletics Attnang-Puchheim have defended their title in the Baseball League Austria. However they needed seven games to down the Vienna Wanderers in the Austrian Baseball Finals this year. Vienna won game six by a score of 5-3 to force the decisive seventh game of the series. The Wanderers erased a 0-3 deficit during game six. In game seven the A’s took a 3-0 lead, were up 4-3 midway through the seventh and then used five runs in the bottom half of the frame to decide the outcome. Its their fourth title in Austrian Baseball history.